Can the memorial for Martin Luther King and Coretta Scott King change perceptions about Boston? Why entrepreneur and philanthropist Paul English believes the memorial is a chance to rid the city of its racist image. As a Boston native, I’ve long believed that we need a major memorial to Martin Luther King Jr. and Coretta Scott King. They spent their formative years here on their journey to changing America and inspiring the world. They grew and matured here as thinkers, artists, and leaders. They met and fell in love in Boston, and they never forgot what our city meant to them. They were every bit as revolutionary for America as the people we honor on the Freedom Trail, and they are less visible than they should be in our city’s collective memory. Raising their profile here by building a major memorial — one that could inspire a million people a year — was my focus when I started MLK Boston. It’s exciting to me that there are still people in Boston who cherish close personal memories of the Kings from their years here. Their legacy has been nurtured in places such as Twelfth Baptist; Boston University, where King received his doctorate; and the New England Conservatory of Music, where Coretta Scott King earned a degree in music education and trained as a soprano. Our project has received widespread support, from Mayor Marty Walsh and major institutions such as the Boston Foundation, as well as more than two dozen individuals who agreed to serve as project advisers. And most importantly, from hundreds of citizens who came to 14 public meetings at sites across the city, from Twelfth Baptist to Temple Israel, from the Martin Luther King Jr. School in Dorchester to the Josiah Quincy School in Chinatown, from the South Boston Boys & Girls Club to the Museum of African American History. What they told us changed the project. People told us the memorial can’t just recall the past. It has to breathe new life into the present and help us change our future. People said the Kings can even now draw us together, call us to action, and inspire a new dedication to ending the inequalities and injustices that are so deeply rooted in our city and our country. In effect, the people of Boston called on us not to memorialize the Kings, but to bring Martin and Coretta back to life. In response, we expanded our vision from a single memorial site to an ecosystem of living history. We’re planning a high-tech, interactive educational experience in Roxbury, where students, residents, and visitors can learn about the Kings’ years in Boston and their work around the world. That project is headed by our advisers Brandon Terry, a King specialist at Harvard, and Greg Shell, a leading social impact investor. We’re creating an endowment, in partnership with Twelfth Baptist Church, to educate and train nonviolent activists. We have also commissioned a 25-minute documentary on the Kings in Boston by local multimedia artist Roberto Mighty, to bring them and our past back to life as only film can. We are looking to raise $10 million in private financing. So far, the Lewis Family Foundation, Demond and Kia Martin, and I have contributed nearly a third of what is needed. A project like this needs big gifts and high-visibility fund-raisers, such as the King Legacy Night on October 16 at the Museum of Fine Arts. And it also requires broad, multifaceted support. 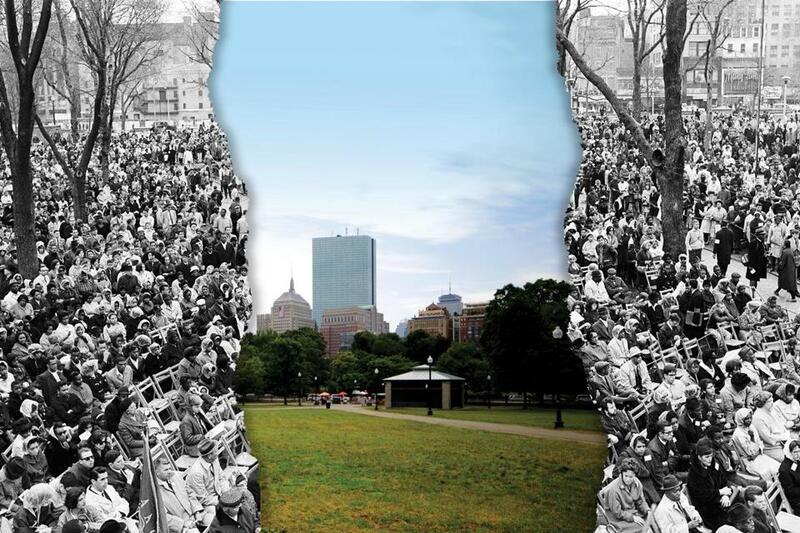 Almost exactly a year after we launched, our outdoor memorial to the Kings is taking a major step toward its eventual arrival on Boston Common, America’s first public park and the place Bostonians have always gravitated to when we want to make our voices heard. It’s where Dr. King addressed 22,000 supporters in 1965, and where thousands gathered to reject racism just last year. We envision our memorial as a place to foster public conversations on how to achieve justice in our city today. And we want your feedback on its design. There were 126 applicants to design the memorial. Our art committee, led by Edmund Barry Gaither of the Museum of the National Center of Afro-American Artists and Karin Goodfellow of the Boston Art Commission, have selected five finalists. They are an international cross-section of some of the world’s best public sculptors and monument architects, several in the Boston area. You can see and respond to their proposals on the first floor of the central branch of the Boston Public Library from September 18 until October 16. We’ll announce the winner in November. The more people get involved, the better the story Boston tells. Our public art communicates our values to the world. In a city that stakes so much of its identity on history, the Kings should be front and center in the story we tell to the world and to ourselves about who we are and who we wish to be. The people of Boston have said they want our memory of Dr. King and Coretta Scott King to help us — finally — make their values a reality in our city. Paul English is a philanthropist and a founder of several software companies, including Kayak and Lola. Send comments to magazine@globe.com. Visit mlkboston.org for more information about the King memorial project.